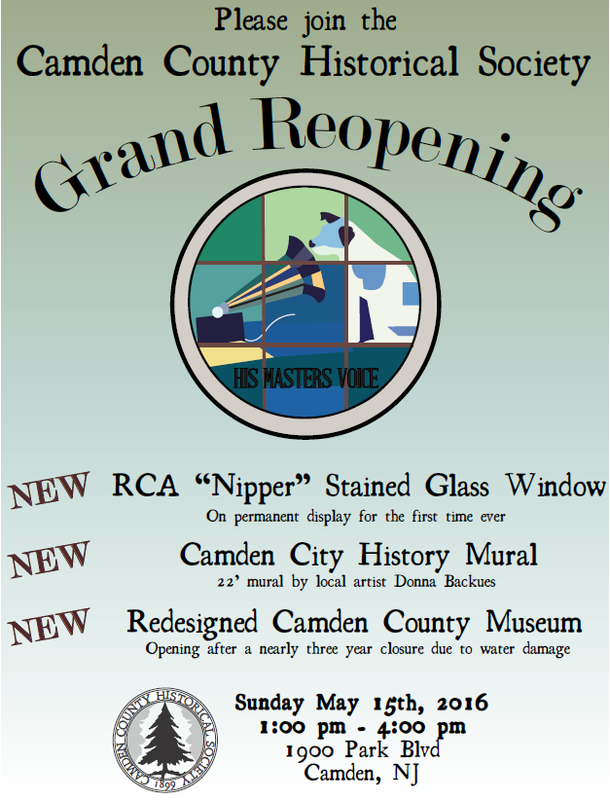 Camden County History Museum Grand Reopening with New Major Attractions - May 15, 2016 ~ The History Girl! The Camden County Historical Society invites the public to the Grand Reopening of the Camden County Museum on Sunday, May 15, 2016 from 1:00 - 4:00 pm. After a nearly three-year closure of the museum due to water damage, the Camden County Museum has been redesigned and will reopen with new exhibits and displays. One new special feature is an original RCA Victor "Nipper" stained glass window. Also unveiled at this special event will be the Camden City History Mural by local artist Donna Backues, featuring significant aspects of our city's history. Please join CCHS for this grand reopening as we celebrate the past, the present, and the future of Camden County! In preparation for this Grand Reopening, the Camden County Museum has been completely reorganized, with new objects and images that tell a variety of new stories from Camden County’s diverse past. Covering the 1600’s to the present, the museum covers many of the prominent businesses, professions, and social movements that shape our current county. The Camden County History Museum is an excellent resource for both adult visitors and school groups who are interested in learning more about our county's history. Created by local artist Donna Backues, the Camden City History Mural encompasses the history of Camden City from the Lenni Lenape Native Americans to the present day. At around 22' long, this new addition to our Camden County Museum will serve as an introduction to our newly redesigned museum space. The topic of the mural was inspired in part by our local Parkside community, who expressed a desire to have more stories represented within our museum. Funding for the Camden City Mural was provided by the William G. Rohrer Charitable Foundation. The Nipper window was originally displayed on the tower of the Nipper building (Victor Building #17), which was completed 100 years ago. D’Ascenzo Studio originally created four of these windows in 1915, basing the design off of the Victor Talking Machine logo: a dog named "Nipper" listening to “His Master’s Voice” on a gramophone. The original Nipper windows remained on the building until 1968; one window was donated to the Historical Society in 1988. Although the Nipper window has been temporarily displayed in the past, it is now a permanent part of the Camden County Museum. The Camden County Historical Society is located at 1900 Park Boulevard, Camden, NJ 08103. It is regularly open Wednesday-Friday 10:00 am - 4:30 pm and Sunday 12:00 noon - 3:00 pm. The Camden County Historical Society is partially funded through a grant by the New Jersey Historical Commission. 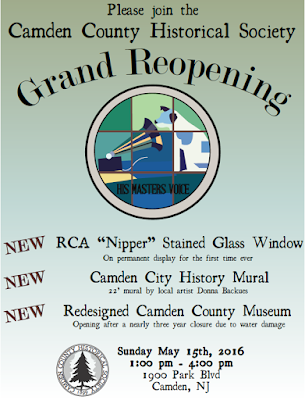 We hope that you will be able to join us on May 15th for the Grand Reopening of the Camden County Museum! For more information, please visit www.cchsnj.org, like us on Facebook www.facebook.com/CamdenCountyHistoricalSociety and Instagram @camdencountyhistorical, call us at 856-964-3333, or e-mail us at admin@cchsnj.org.